fly, my little friends, fly!! — halthegal. my faerie tale feet art was included in a litjoycrate!! i got to paint a double-sided woodmark celebrating the one and only superman/clark kent for inclusion in their dc icons SUPERMAN: DAWNBREAKER march box!! as is my standard practice for any faerie tale feet piece, i get my hands on as much reference material as possible. of course i marked some pages with sticky flags for reference (cape! legs!) and got to make up most of it after being all sorts of nostalgic & inspired. i was struggling with feet position for the superman side of the woodmark. & here’s clark kent’s side of the woodmark in progress— with icons in the background representing his past, present, and secret identity. and the funnest part of the whole process: adding colour!! i mix my gouache (a vibrant, opaque watercolour) on paper plates so i can re-use all my mixes. so here’s some of the colours i used and layered on both paintings. i worked both sides simultaneously— slowly building values and subtle colours. & here’s a nearly-done image of clark kent’s side of the woodmark! -and more reporter necessities: his hat, coffee cup, & typewriter. i loved playing with the juxtaposition of him saving lois on one side (she was rather daft in the old cartoons! ), and the laid-back ease of his reporter self with his feet up on the desk like he hadn’t a care in the world. 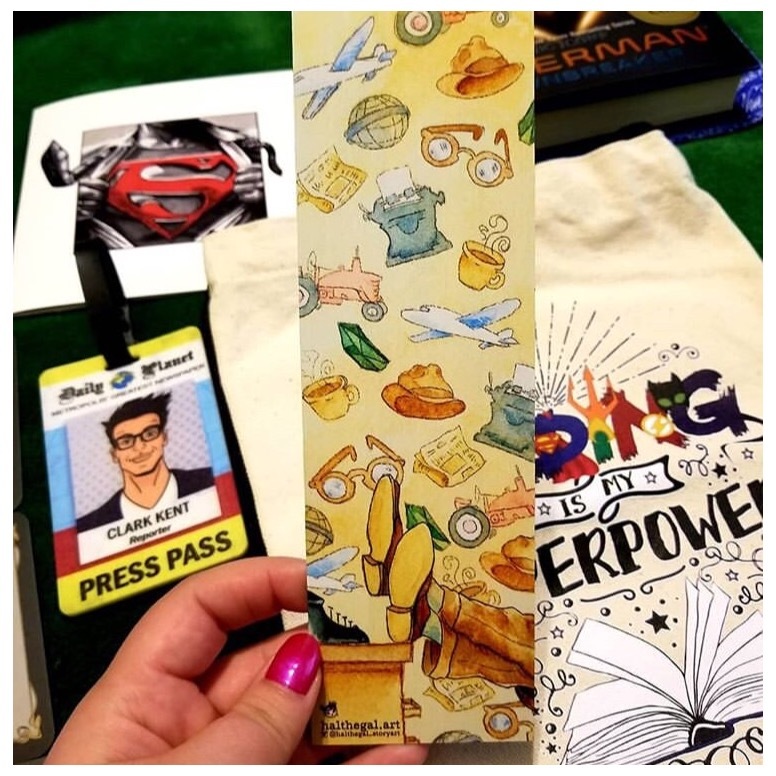 and here’s one SUPER fan’s unboxing pic of march’s litjoy crate holding up the clark kent side for you to see! thank you again, litjoy crate for letting me create these very special pieces of art for your readers!